Somewhere along my journey of learning how to heal naturally from Hashimoto's, I began hearing about the many benefits of fermented foods and drinks. They are loaded with probiotics, and aid in gut and immune health. Kombucha is a fermented drink made from tea and contains beneficial acids and enzymes in addition to probiotic cultures. 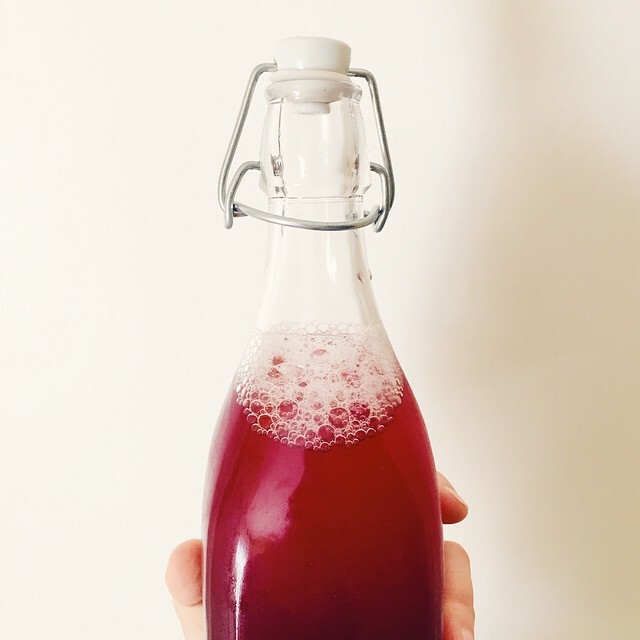 (Find out more about kombucha and its many benefits in this great article from Balance Me Beautiful!) It's fizzy and can be slightly sweet depending on how long you ferment it. The first time I tried it years ago, I absolutely hated it. I think it was mostly that the flavor was so unexpected, and when I finally tried it again I didn't mind it much. Now I actually really enjoy it. Making it at home beats store-bought in both price and freshness. It's really easy and doesn't take a ton of extra time. The easiest way to start it is to ask around and find a friend who can give you a scoby (the kombucha starter culture, which is very strange looking but totally non-threatening, I promise. It's name stands for "symbiotic culture of bacteria and yeast". Yum!) Scobies are always growing new top layers, so it's great to give pieces away to friends interested in starting their own brew! 1. Bring the gallon of water to a boil, remove from heat and add the tea. 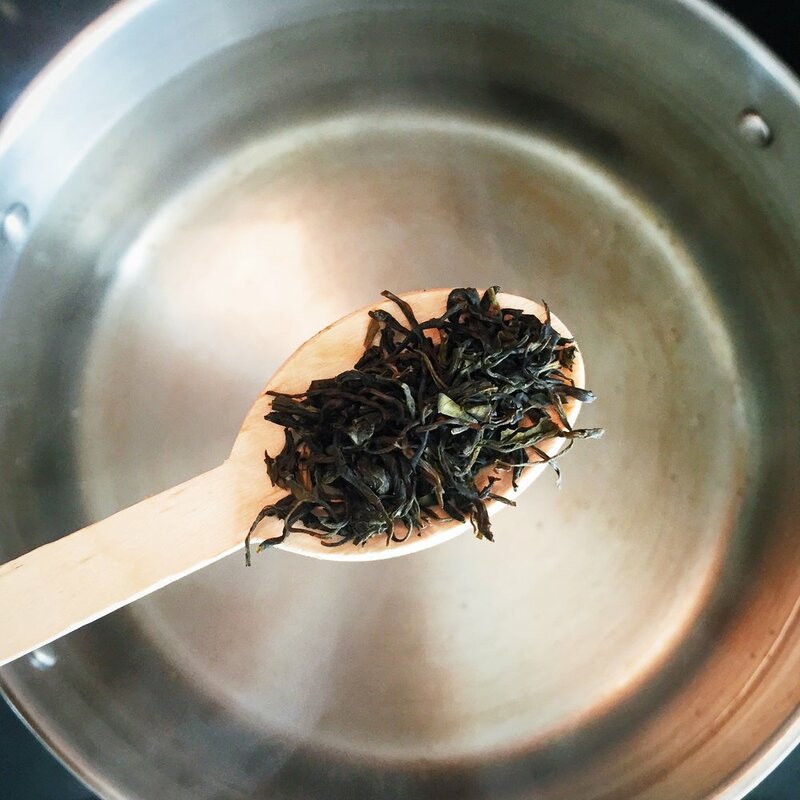 Steep for a few minutes and remove bags or strain loose tea. 2. Add the sugar and stir. 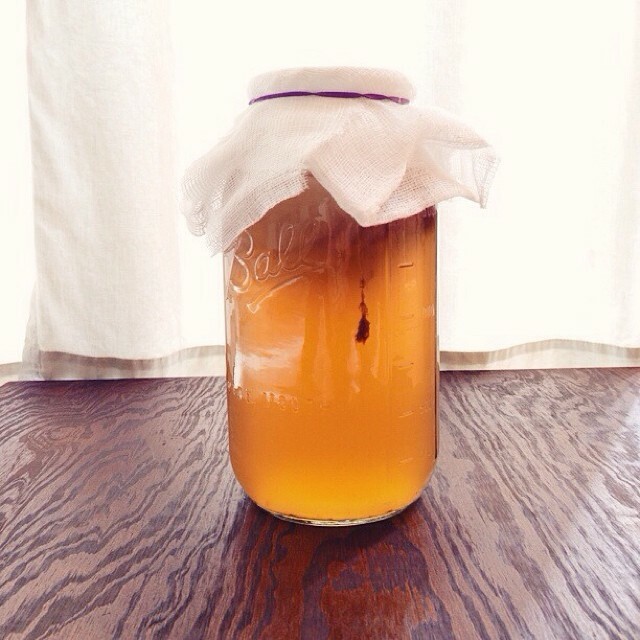 Cool to completely room temperature (heat will kill your scoby). 3. When the sweetened tea has cooled, pour into a gallon-sized glass container (like a really big mason jar—I just use two, and I have two separate scobies. This fits better in my little kitchen. Cover with cheesecloth and secure with a rubber band and let the jar sit in a dark corner at room temperature. 4. Let it ferment for at least a week or up to a few weeks—it will get less sweet and sour towards the end. Taste it, and when it seems right to you, remove the scoby and all but a cup of the kombucha and pour into glass containers (mason jars or these bottles work well). Save the reserved liquid to start your next batch. Store your kombucha in the refrigerator. You can drink this as it is, or you can continue to ferment it for a couple more days in bottles in the fridge—just add in any fruit you wish (fresh or frozen- some good options include berries, ginger, or pineapple), and be sure to burp the bottle each day to release the pressure. After a couple days your kombucha will be fizzy and delicious, and you can strain out the fruit and return the kumbucha to the bottles and keep refrigerated. It will keep for up to a couple months, but I doubt it will last that long!